This event is a fundraiser for the Autauga Interfaith Care Center food bank. There will be a Soup Cook Off with teams and individuals competing for the Golden Bowl Award and soup from local restaurants. 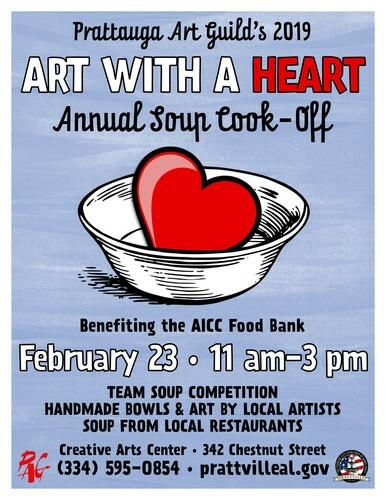 For a donation of $5 you get a cup of soup from one of our restaurant sponsors, for a donation of $10 or more you get a cup of soup and a handmade bowl by a local artist. For information, contact the Special Events Office at (334) 595-0854.